Hello and congratulations on your blog’s recent milestone! I have a question regarding cashmere suits. I am thinking of buying a suit that is 100% cashmere. Now I have come across many suits that are wool/cashmere blends, but not many that are 100% cashmere. Is a suit that is completely cashmere practical? Will there be a lot of pilling, like there is with a cardigan for instance? This touches on a question someone asked about ultra-fine wools on my post about Huddersfield mills last week. The finer a wool becomes, the more it loses body and elasticity; it loses some of the elements that make wool such a great material for clothing. Cashmere is even worse. It is wonderfully soft, but this means it has very little body and memory. This can be OK in a jacket, which has internal structure in the chest to hold it together. But it is terrible in trousers. They have no chance of retaining a crease, and begin to bag at the knees after a while. 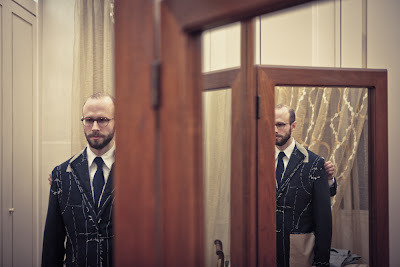 I know because I made that mistake with my first commission from Sartoria Vergallo. The jacket is great, but the trousers have lost shape very quickly. I still occasionally wear it as a suit, but mostly just as a jacket – it has patch pockets and brown horn buttons so works well in that regard. I would avoid wool/cashmere mixes most of the time as well, at least for suits. You can follow the discussion on Reader question: Cashmere suits by entering your email address in the box below. You will then receive an email every time a new comment is added. These will also contain a link to a page where you can stop the alerts, and remove all of your related data from the site. Why not wool/cashmere mixes? Aren’t they quite good for jackets, at least, or do you think they would stretch too much even then? No, still good for jackets, and 100% cashmere can work well for jackets as well. That last point was meant more for suits, and certainly in terms of value for money on the cloth, it’s not worth paying for. Thanks for the great blog. I am interested in having a 3 piece suit made for my wedding and I would like to be able to use the suit for a while to come. A tailor here has offered me a S140 1oo% cashmere wool suit for ~US $ 400 (they are having a 50% sale). I am assuming it will be a cashmere wool blend but after reading your comment I have some concerns. Should I be considering a different fabric like a 100% wool suit without the cashmere? I am living in Africa so the hot climate is also a concern. Thanks! A cashmere blend, say 10% is fine. But I wouldn’t pay for cashmere in a suit at all, to be honest. You’ll pay more and notice no real benefit. Also, $400 for a suit means it must be MTM at the very best… Do you know much about what they make and how? This is pretty much all I know at this point, but out of curiosity, when purchasing a tailor made suit, what are the important questions that one should ask of the tailor? Having an entirely new pattern made for you is pretty much the definition of bespoke. However, I would be very wary of suits made abroad in this manner. I’ve had things made in Hong Kong before and they often suffer from poor styling and poor fit. Also, fabrics from Thailand doesn’t sound that promising. Even HK tailors use Italian mills. Thanks Simon, this was super helpful! I will definitely try to find something I like in retail first and get more info from the tailors as well. Have a great day! Would a unstructured cashmere jacket have difficulty holding shape? Would you suggest wool instead for unstructured jackets as you have for pants? I am looking to get a tailor made suit form http://www.institchu.com, one of the leading suit tailoring online at the moment. The particular suit I am looking to create is sort of like a dinner suit, black with a satin shawl lapel. As such, I’m worried about the type of material i should use. I’m torn between full wool, wool/cashmere blend, and wool/polyester blend. Should the suit have a slight sheen to it given the tuxedo-esque look I’m after? Was looking at a Hunt & Winterbotham cloth with 3% cashmere (97% merino) recently. Would it be safe to say that should be fine for suit trousers? Had a great feel but may have also been the fact it was a super 140 or 150. Thanks. I wanted to ask if you know bespoke shirtmakers based in Verona that you would recommend. I find that the luxuary of CASHMERE in you require durability. SKOPES in the UK have created such a mid-weight fabric for all seasons. An new innovative Suiting creating a special fabric that creates a 120’s superfine wool handle blended with 3% Cashmere and uses a small amount of polyester to give extra durability. Thanks, and you're right the buttoning point certainly affects the lapel length. Personally I prefer a longer lapel too. Some regional styles do have it consistently shorter though - see Vestrucci and Liverano, for example.